[S90] Scotland, Statutory Register Index Deaths, 685/02 0216. [S90] Scotland, Statutory Register Index Deaths, 685/02 0454. [S90] Scotland, Statutory Register Index Deaths, 685/02 0617. [S90] Scotland, Statutory Register Index Deaths, 685/02 0062. [S90] Scotland, Statutory Register Index Deaths, 685/03 0104. [S232] Ancestry.com, Scotland, Select Births and Baptisms, 1564-1950. [S90] Scotland, Statutory Register Index Deaths, 685/04 0270. [S469] Jean Christie and her children, Manuscript notebook, say 1920's unknown repository. [S90] Scotland, Statutory Register Index Deaths, 685/04 0312. [S90] Scotland, Statutory Register Index Deaths, 685/02 0832. [S90] Scotland, Statutory Register Index Deaths, 685/02 0073. [S17] John Gask, Les Jumelles and their families, p.81. Constance Edwina Cornwallis-West was baptised on 7 June 1876 at Rutin, Denbighshire.1 She was the daughter of Col. William Cornwallis West and Mary Adelaide Virginia Thomasina Eupatoria Fitzpatrick.2 Constance Edwina Cornwallis-West's birth was registered in the quarter ending September 1876 in the Rutin, Denbighshire registration district.3 She married Richard Arthur Hugh 2nd Duke of Westminster on 16 February 1901 in St George Hanover Square, London. Constance Edwina Cornwallis-West and Richard Arthur Hugh 2nd Duke of Westminster were divorced in 1919. 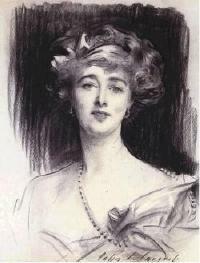 Constance Edwina Cornwallis-West died on 21 January 1970 in Brockenhurst, Hampshire, at the age of 93. [S89] Family Search, Wales, Denbighshire, Parish Registers, 1538-1912. [S17] John Gask, Les Jumelles and their families, p.43. [S232] Ancestry.com, England & Wales, Civil Registration Birth Index, 1837-1915. [S21] Various editors, Dictionary of National Biography. [S117] The Times Newspaper, 3 April 1951. [S117] The Times Newspaper, Jan 18, 1941. [S117] The Times Newspaper, Jul 13, 1943. [S205] Newspaper, Cheshire Observer, Saturday, December 12, 1891. WATERVILLE - Regina Nazzarena Sewall, 93, died Thursday, Feb. 28, 2013, at her residence. She was born Jan. 27, 1920 in Bradford, Pa., the daughter of Teresa and Augusto Corsi. She attended St. Bernard's Elementary and High schools. After graduation, she went on to the Saint Francis School of Nursing in Pittsburgh, Pa. She received her R.N. in October 1940 and was employed by the hospital. In 1943, she entered the U.S. Navy Nurse Corps as an ensign and served at the Philadelphia Naval Hospital until July 1944. She was then transferred to the San Leandro Naval Hospital in California, where she met Dr. Kenneth Sewall whom she married in December 1945. In March 1945 she graduated from the School for Air Evacuations at the U.S. Naval Air Station in Alameda, Calif. As a flight nurse, she attended casualties to the war in the Pacific as they were flown back from forward areas. After peace was declared, she joined a team of active service people promoting the sale of U.S. Bonds in the Pittsburgh area. She was discharged from the service March 1946 with the rank of lieutenant junior grade. Arriving in Waterville, she helped her husband in the first months of his practice and did the same when he became semi-retired for a four-year period. She was a member of the Corpus Christi Parish, served on the Mansfield Clinic Board as secretary, a member of the Hospital Auxiliary, a guild member of the Historical Society of Early America, a member of the Samaritan Department of the Waterville Woman's Club, a past longtime member of the Waterville Country Club, a member of the Waterville Historical Society and a member of St. Francis Medical Center School of Nursing Alumni Association. She had many interests, never at a loss for something to do. Most of all, she loved the time spent with family and close friends. She was predeceased by her husband, Dr. Kenneth Sewall; and a daughter, Nancy. [S480] Emma Ten Broek Runk, The Ten Broeck Genealogy, #453. [S250] Saint Nicholas Society, Vol. 1. p 86. [S176] Cuyler Reynolds, Hudson-Mohawk memoirs. [S62] William Richard Cutter, New England Families. [S250] Saint Nicholas Society, Vol. 1. p 171. Maria van Cortlandt was born in 1680.2 She was the daughter of Stephanus Van Cortlandt and Geertruj Schuyler.2 Maria van Cortlandt married Kiliaen Van Rensselaer, son of Col. Jeremias Van Rensselaer and Maria Van Cortlandt. [S162] Unknown author, Livingstone Genealogy, p. 545. [S250] Saint Nicholas Society, p. 45. (The Cornell Library New York State Historical Literature). [S75] Frederick Lewis Weis, Colonial Clergy, p. 190. Gostwick Clarence Cory is also recorded as Goswyck Cory.1 He was born on 5 January 1914. He married Mary Arbuthnot Crombie, daughter of David William Alexander Crombie and Phoebe Janet Arbuthnot, in 1948. Gostwick Clarence Cory died in March 1992 in Queensland at the age of 78. [S6] Crombie-Sewell Family tree in the possession of John Rees. [S232] Ancestry.com, Australia Birth Index, 1788-1922. Georgiana Coster married William Henry Troop. Henry William Cothay was born in 1888 in Sunderland. He married Isabelle May Fraser, daughter of Alfred William Fraser and Clara Phillips, on 23 December 1922 in Bombay, India.1,2 Henry William Cothay died in 1965 in Warminster, Wiltshire. [S197] David Griffith, Communication from David Griffith. [S232] Ancestry.com, India, Select Marriages, 1792-1948. [S232] Ancestry.com, Jersey, Church of England Marriages, 1754-1940. [S232] Ancestry.com, England & Wales, National Probate Calendar (Index of Wills and Administrations), 1861-1941. [S348] Charles Martyn, The William Ward genealogy, p. 176. [S240] Samuel Sewall, Diary of Samuel Sewall (1888 ed. ), p. xxxiii. [S89] Family Search, Minnesota, Births and Christenings, 1840-1980. [S24] Sarah Elizabeth Titcomb, Early New England People, p.151. [S130] Massachusetts Vital Records, Vital Records of Newbury, Massachusetts to the Year 1850. [S24] Sarah Elizabeth Titcomb, Early New England People, p. 170.